But this is a story of what happened when I decided not to find that napkin, nor take that seat. This is a story of waiting in a bar, for nothing to happen. And then something did. Virginia is a first person ‘walking simulator’ that was released back in 2016. In it, you play as Anne Tarver, a graduate FBI agent on her first job; a missing persons case. I won’t delve into any story-spoiling here, but the game tells a story clearly inspired by mystery shows such as Twin Peaks and 90’s X-Files. And like those stories, it primarily takes place in a small rural town, in middle-of-nowhere-America. Many of the environments in Virginia are rich with details and atmosphere, but none more so than the Roadhouse bar of Chapter 18. This place is a real dive. But it’s also one of the most affective moments of immersion that I’ve felt in a video game. I only got a glimpse of the bar’s name as we crawled up the driveway; Sojourner’s Truth. This author is not in a position to provide an in-depth perspective on the racial and sexist undertones that drive so much of the emotional heart of Virginia’s story, but even so, the aptness of name was not lost. Inside the bar, the power relations are amplified, and diversified. In the lobby, right before you enter, my partner gives me her wedding ring. Just in case I might need it. I anticipate hostility. When I entered the bar, I could almost smell the dank smoke and booze, emanating from the carpets and upholstery. The graphical style in Virginia is simple, but striking. There was a hum from the band in the corner, and I was left to explore the roadhouse at my leisure. On my left was a darts board, inviting me to throw a few arrows. If only I had some friends here. Next to that, is a long bar that travels the length of the room. A tough looking barmaid is glaring over at me. She might be looking to take my order, or she might be looking to kick me out. Either way, I stand and stare at her for way too long; trying to figure her out. In the far corner, a green light entices; its sharpness at odds with the surrounding ‘dullness’ of the bar. As I got closer however, I saw that its brightness was a necessity, as opposed to a stylistic choice; it’s the fire exit. With the surrounding hostility, at least it was nice to be aware of a way out. That hostility takes the form of the other drinkers. There aren’t many, but like the barmaid, they ambiguously glare at me. Again, I stand for too long trying to figure them out, or maybe I didn’t want to move in fear of them following me. I wasn’t sure. On the stage was a singer, highlighted in red. Like the others in the bar, she was patiently waiting for her cue to start. And that cue was the player, me. once I was supposed to have exploring, I would sit down and the beat would kick in. She was then supposed to sing. But, in my playthrough, I decided against giving that singer her cue. Instead, I waited. I stayed in the room, going back and forth to the bar, the fire exit, the imposing drinkers, the dart board. I spent over 10 minutes not doing anything; the music waited to kick in, but I didn’t ever want it to. And what started off as a nervous, menacing location, in which I was wary of all around me, slowly became comfortable. I began to relax into the space. There was nothing I could mechanically ‘do’ in this space, but that also meant that nothing was expected of me. I was left to just soak in the ambience. 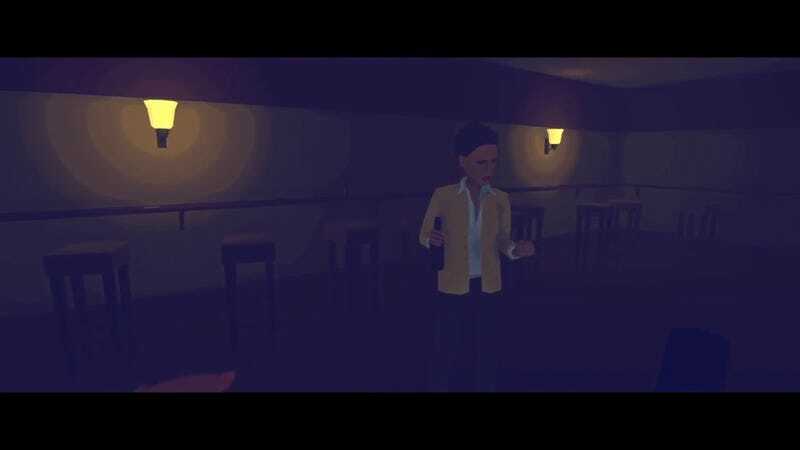 In some ways, Virginia’s bar highlights the limitations of the Walking Simulator genre. It is unapologetically linear, and frankly authoritarian in its guiding of the player. There is no way to mechanically interact with the game, outside of walking, looking, and then clicking to progress the next part of the story. There aren’t even any choices to make, or divergent story paths. You’re on a straight shot to the end. And in the landscape of sandbox-videogames like BotW and Minecraft, that can feel suffocating. But the linearity also offered me a security in how to play this story. How to have this experience. I knew from moments of entering the bar, that my only option was to sit down, and wait for it to play out. I didn’t need to worry about making the ‘wrong’ decision, or missing a part of the story. Because that was all that was needed. So I took that opportunity to take my time. To feel the place around me. And I settled in. And as I settled in, I didn’t feel the need to move on. Or ‘click’ through to the next part of the game. And in lieu of those mechanics, something more meaningful came to the fray. Eventually I did ‘click through’. I can’t remember why. And I’m not really sure how long it was before I did. And so, the scene ended, with a dance. A dance that slowly faded into slow-motion. A dance that I wanted to last forever. Has anybody else just felt attached to a virtual environment? Has there ever been a time where you stopped wanting to ‘play’ a game, and instead just wanted to ‘breathe it in’? I’d love to hear about other people’s experiences. Follow Conor on Twitter and we too can dance whilst time stands still.